Sometimes after 1, a woman is also shown as well. What is her purpose? What you're talking about is a Film Leader. Originally, a frame was inserted once every 16 frames (16 frames per foot for 35mm film) with numbers marked 11 to 3. At some point in the mid 1960's that was changed to a continuous countdown with a new number every second (time interval as opposed to length interval) that ran backwards from 8 to 2. If you google "Film Leader Countdown", you should be able to find a number of examples on YouTube and Vimeo. The purpose of this was to assist in the threading of projectors. The woman you speak of is referred to as a "China Girl". That image is used to calibrate the film color when it's being processed. This is known as a film leader and as well as a countdown to the start of the movie itself, also often contains technical information for the projectionist including aspect-ratio, sound settings etc. The purpose of the leader is primarily to allow extra film for the projectionist to wind onto the projector. 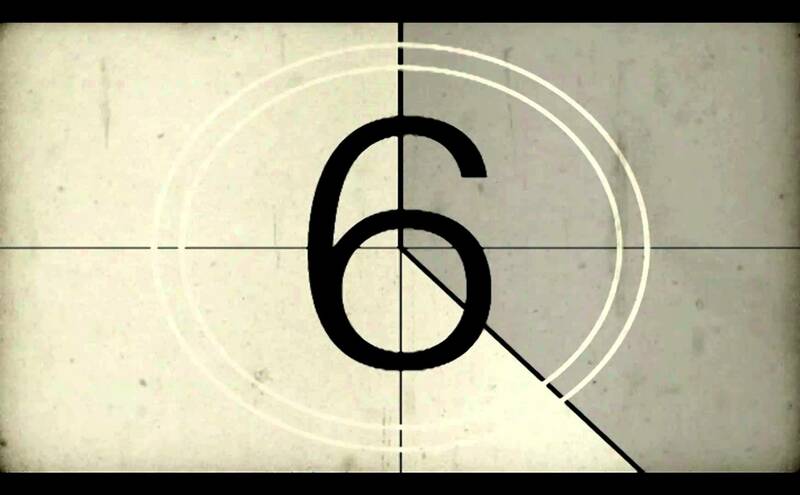 The countdown is just to show the projectionist how far from the start of the movie itself in seconds rather than feet. The girl you refer to is known as the China Girl used in the developing process of the film itself. The countdown and beep are also used for audio/video synchronization. The beep must correspond exactly with the number transitions. Some leaders also had a flash at each second mark to help with adjusting the beep. This process was later automated with equipment that can detect the flash and beep and align them. See 2-Pop For related information. Many movies are too long to fit on a single transportable roll of motion picture film. Although some movie houses would have shown such movies with a short intermission between rolls, most decent movie houses would have two projectors. The first roll would be shown on the first projector, and then while that roll was playing the projectionist would have about 20 minutes to load the second roll on the second projector (if it wasn't set up earlier) and advance it to a spot slightly less than two seconds before the start of content on the second reel. Two seconds before the end of the first reel, a flash in the corner of the screen would alert the projectionist (or a piece of automated equipment) to start the second projector. Two seconds after that, a second flash would alert the equipment to switch on the light and audio for the second (already moving) projector and switch off the light and audio for the first. Once the second roll of film was being shown on the second projector, the projectionist would then have 20 minutes to load the third roll onto the first projector and cue it to a spot just under two seconds before the start of content. At the end of the second reel, a flash will indicate that the first projector should start, and a second flash will indicate that the light and audio should switch back to the first projector. Because projector mechanisms do not start instantly (and a projectionist who is manually switching projectors won't have instant reflexes), the ideal spot to cue a projector will be slightly less than two seconds before the start of picture content to compensate. Movies are almost always edited in such a fashion that a small amount of imprecision on the change-over won't matter (e.g. change-overs will correspond with changes in scene) but projectionists still tried to handle change-overs as cleanly as possible. Having a clear countdown leader can help projectionists judge where they should cue the film (note that the numbers are really big, so a projectionist may be able to see them on the film even when the projector's main light is off). What is the sweariest movie ever? Why is the last scene (right before and including the end credits) often worse quality in transfers of older films?